Adler & Allan has expanded its operations in Scotland by opening up a new depot and offices in Aberdeen to provide the region with easier access to its range of environmental, fuel, waste and asset management services. 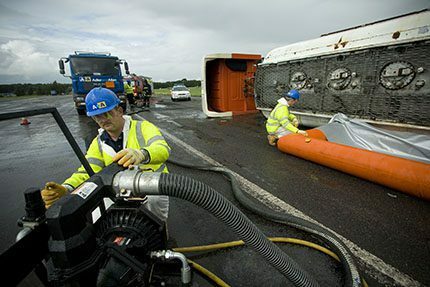 Support available from the depot includes A&A’s 24/7 emergency response, covering flooding and polluting spills. Flooding in particular is a growing concern for many regions in the UK; A&A can provide 360-degree flood mitigation services for businesses, including flood mapping, risk assessments, defences and clean up. In addition, customers can access asset protection, such as the refurbishment of essential equipment and sites, the toughest protective coatings and linings, waste transfer and disposal, fuel and forecourt services. The company also delivers a range of consultancy to help businesses comply with their environmental obligations and deal with specific issues, such as contaminated land. “We are delighted to open our new depot in Aberdeen,” said Ken Salmon, Adler & Allan’s general manager for Scotland.